Please fill out and submit the form below for your reservation request. Please note that this form submits a request for a site, and is NOT a confirmed reservation. Once we have reviewed your request, we will contact you to confirm your reservation. NOTE: If your planned arrival is within the next 48 hours, please call us at (928) 788-6666 to reserve by phone. Valid card/ID required at check-in. Nightly: Cancellations made thirty (30) days prior to scheduled check-in are subject to one (1) night reservation fee. Cancellations within 72 hours prior to arrival are completely non-refundable. Weekly & Monthly: Deposits in the amount of $100.00 are subject to fifty dollars ($50) fee, if cancellation is made more than 30 days prior to arrival date and in writing. Cancellations made within 30 days of arrival are non-refundable. Deposit refund requests must be signed in office before departure. All refunds will be mailed by Company Check or credited to guest's credit card. NOTE: All rents are consecutive usage, non-refundable, non-refundable for early departure and are non-transferrable. I have read & accept the cancellation policy as stated above and understand that I am submitting a request for a site. 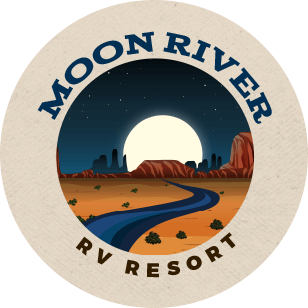 I do not have a reservation until I receive confirmation from Moon River RV Resort.